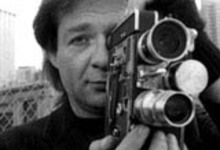 Since 1969, Dominic Angerame has made more than 35 films that have been shown and won awards in film festivals around the world. He has also been honored by two Cine Probe Series at the Museum of Modern Art in New York City — in 1993 and in June 1998. His most recent work Anaconda Targets (2004) is being exhibited at the the Whitney Biennial (2006), and was exhibited at the Toronto International Film Festival, Onion City Film Festival, Chicago, New York Film Festival, and the Vienalle in Vienna, Austria and will screen at the Hong Kong International Film Festival, Rotterdam Film Festival, Nashville Film Festival, and many more. Dominic Angerame present his “City Symphony Series” along with Pixiescope, Waifen Maiden, Consume, and Anaconda Targets at the Havana Film Festival (Festival International del Nuevo Cine Latinamericano) 2006. This was the first time experimental cinema has been presented at this festival during the past 28 years.